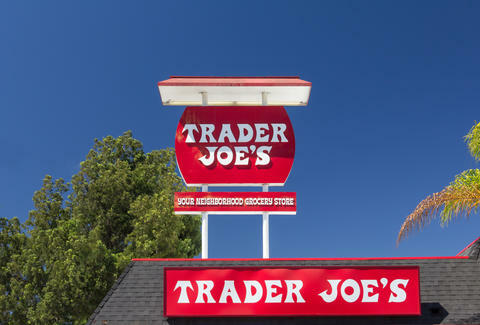 Trader Joe's is a venerable grocery institution known for a bevy of name-brand foods and a staff clad in Hawaiian shirts. The grocer also has a cult-like following that loves to devour its tasty products. So for Trader Joe's 50th birthday on August 25, the company will spread the love to all of its faithful clientele with free product tastings and giveaways this weekend, August 19 and 20. It'll also be selling TJ's reusable grocery tote bags for 50 cents. If there was ever a decent occasion to eschew eating out in favor of shopping, now is probably your chance. In case the impetus for the giveaway didn't immediately register: Trader Joe's is now 50-years-old. The company started as a humble purveyor in Pasadena, California on August 25, 1967, but has since grown into a behemoth, with 467 stores in 41 states and Washington, D.C.
For the uninitiated, walking into a Trader Joe's can seem like entering a maze of strangely affordable groceries that you never knew existed. And when it comes to navigating that minefield, we've done the research. For starters, there's usually a dense selection of frozen foods that's likely to pique your interest (Kung pao cauliflower tempura, anyone?). But when it really comes down to it, the chain is probably best known for its iconic offerings of cheap hooch, as its Charles Shaw wine, or "two buck Chuck," is always available in large quantities. So while you're doing some grocery shopping this weekend, make sure to do it at TJ's. With all the free offerings on hand, you'll definitely come away with more than you bargained for, and that's saying something.